SPY rose by 2.5% this week, to a new all-time high! My account beat SPY by rising 2.9% for the week, to its highest value since April 20th. The loss-floor is now -7.7%, tieing its value for July 20th. Euro news: The ECB’s plan to save Europe amounts to a copy of OpTwist: buy short-dated bonds and sell long-dated ones. It remains unclear whether Germany will permit this; Austria and the Netherlands have already said “No more of our money to save Europe”. The stock market jumped on the news, perhaps because of stealth money-printing by the authorities. US news: Official unemployment fell by 0.2%, even though 100,000 fewer people had jobs, because more people gave up and stopped looking for work so they don’t “count” anymore. Almost 26 million Americans are unemployed, underemployed, or despondent about employment. The stock market jumped on the news, presumably because of stealth money-printing by the authorities. US markets were closed on Monday for Labor Day. 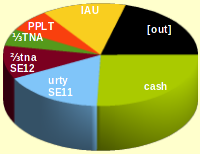 IAU, PPLT: Doing very well! Unfortunately, this suggests that inflation is rampant and food prices will be rising. TNA: Decided to sell ⅔ of this at Friday’s open, since there were some signs of an “exhaustion top”. I haven’t done any partial sales since November 17th. Unclear whether it was a good move this time. HostMDS.ca: No hiccups this week, but quote-timing remains highly variable. This server needs replacement. VPSville.ca: I have rented a server and am setting it up. Initial impression: very fast! URTY: Another measly two-week trend. Where’s my QE3 trade that goes on for months? TNA: None of my current models contemplate partial sales, so I have to wing it when recording this override.